Open Network Connections from the control Panel and click create a New Connection. In the Welcome to the new connection wizard click Next. In the Network Connection Type window select Connect to the Internet. Click Next. In the Getting ready windows select Set up Connection Manually. Click Next. In the Internet Connection windows select Connect using a Broadband... Click Next. In the Connection name windows enter the connection's name. Click Next. In the Connection Availability window select Anyone's Use (if you want to). Click Next. In the Internet Account Information window enter your ISP-given username and password. Enable this connection to be the default connection, enable ICF and allow connecting without the need to prompt for a username and password - if you want. Click Next. In the final window select to create a desktop shortcut (if you want) and click Finish. A connect ISP PPPoE window will appear. Try to connect. Go back to the Network Connections window and see your new icon. You can change it's properties by right-clicking on the icon. 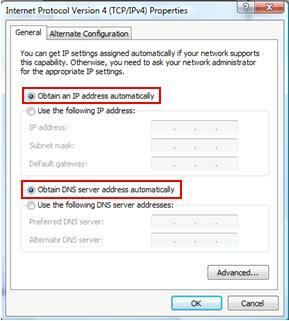 Before you start to configure this dialer, configure network card to obtain IP address and DNS server automatically. 1) Go to Start, right click Network and click on Properties. 3) And here connection setup wizard will appear, select Connect to the Internet option and click Next. 4) How do you want to connect? Just click on Broadband (PPPoE) option. 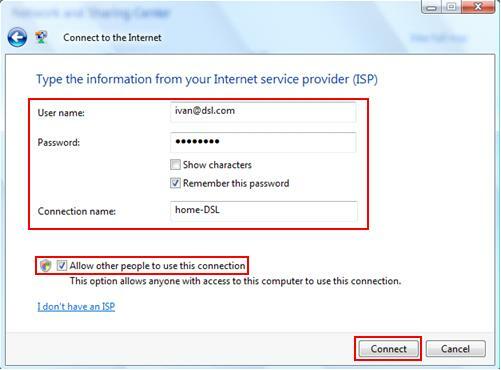 5) Type in username and password of your DSL or Cable Internet connection, this info is given by ISP when you subscribe Internet service. Give a name to your connection and so you can identify easily later. You can also tick the option to allow other people to use this connection. Finally you can click Connect to trigger you Internet connection. 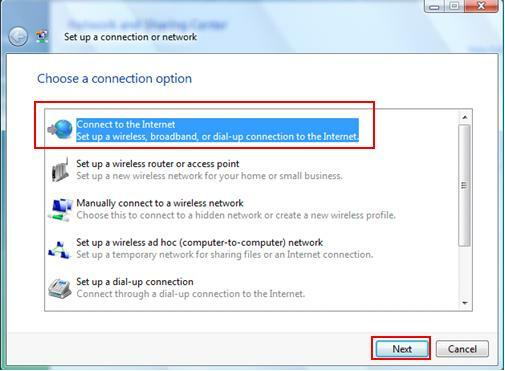 6) In future, you can just go to Start -> Connect To in order to bring up Connect to a network window, and here you can select your DSL/Cable dialer you created by name and click Connect to trigger Internet connection. - Open the Windows Control Panel. Control Panel can be found on the Windows Start Menu. 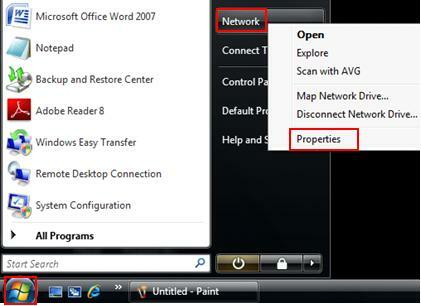 - Open the "Network Connections" icon in Control Panel. The Control Panel will refresh to become the "Network Connections" window. If necessary, first open the "Network and Internet Connections" icon in Control panel, then choose "Network Connections" from within that screen. - The Network Connections window lists all Dial-up and LAN / High-Speed Internet connections installed. In the list of LAN / High Speed Internet connections, select the icon that corresponds to the network you wish to enable or disable. - Right-click on the selected network connection. A pop-up menu appears. If the connection is currently enabled, the first option in this menu will be "Disable." Otherwise, the first menu option will be "Enable." - Select this first menu option to alternately disable or enable the connection. - Close the Network Connections / Control Panel window when finished. netsh winsock reset is useful command that you can use in Microsoft Windows to reset winsock catalog back to default setting or clean state. You can try this if you are having following Internet access or networking problems but still failing to resolve the problem after trying all other suggestions. If you are using Windows XP, here is the way you can launch command prompt after logging in as administrator. 2)Type cmd.exe and click OK. Note: If you are Windows XP user and don’t used to play with commands, then you can try Winsockfix program to reset winsock catalog. If you are using Windows Vista, here is the way you can launch command prompt. 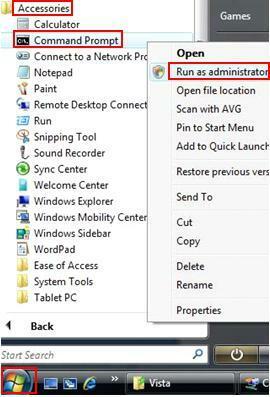 2) Right-click on Command Prompt and click Run as administrator. 3) Type netsh winsock reset in command prompt and hit ENTER button. 4) Restart the computer in order to complete the reset, after that test to access your network or Internet again. - Check and confirm that you have used the correct network cables (straight or crossover) to make the connection. Check here on when to use straight or crossover cable to connect network devices if you are not too sure. - If the network cable is correct, then you can try to use other network cable and test it. Sometimes the problem can be due to faulty network cable. - Connect the network cable to other ports of the router/switch. Sometimes the problem can be due to faulty network port on the network devices. - Disconnect and reconnect the network cables on both connecting devices to ensure there is no loose connection. - Ensure the network card driver is installed properly. If not, reinstall it again. Also you can go to manufacturer website to download the latest driver for your network card and install it. - If you have extra network card, then replace the existing one to test whether it’s network card problem. Sometimes if your network connection is down and you can use ping to troubleshoot network problem and then fix it. 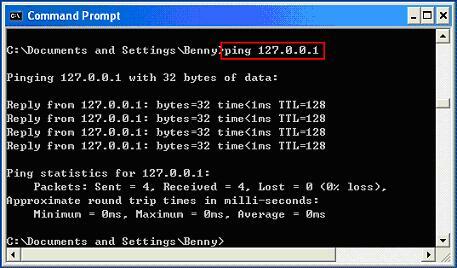 Ping is a program used to check whether a host is up and active in network. It’s pretty simple and usually used to troubleshoot network problem. Here is typical home network design, and the technique described applies to wireless network as well. 1) First thing you need to do is to make sure there is light on network card with cable connected. Sometimes network down is due to disconnected network cable or loose cable connection. If you notice no light on your network card after connecting with network cable, make sure the network cable is working and router that connected by this computer is up and active. If you see the light, then proceed to step 2. 2) Go to Start and click on Run. 3) Run window will appear. Type in cmd on Run window and click OK.
4) Key in ping 127.0.0.1 in Command Prompt window. This is network card loopback address. If you receive Reply from 127.0.0.1, it works. If you receive Request timed out, it means network card doesn’t work properly. Unplug and re-seat the network card, connect with network cable then ping loopback address again. If still fails, check the network card driver status in Windows 7, Vista or XP to troubleshoot network card and make sure the card works well. If still fails, most probably the network card cannot be used anymore. Try again by using other network cards. However if you just cannot install network card driver correctly on this computer but it works on other computer, then maybe there is problem on Microsoft Windows OS or its TCP/IP function. 5) Now you can proceed to ping your computer IP address. If you are not sure about computer IP, use ipconfig to find out. 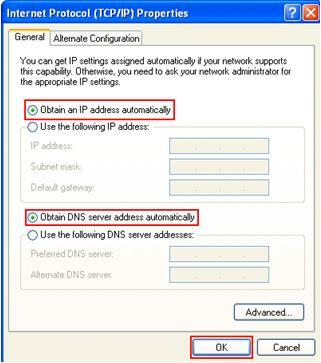 If you fail to ping this IP or no IP is configured on computer, check network configuration such as IP address (assigned manually or automatically? ), subnet mask, gateway on network card to make sure it's configured correctly. 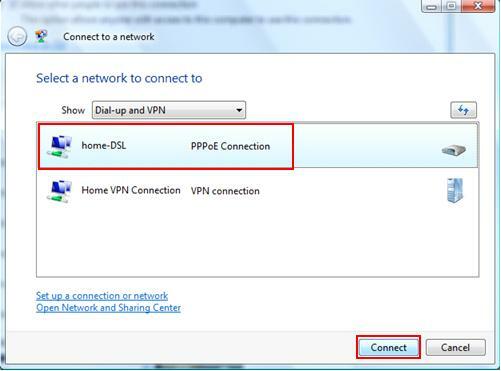 6) If you able to ping loopback address and your computer IP, now you can proceed to ping router IP address. if you receive Request timed out, make sure router is up and configured properly with correct IP, subnet mask, DHCP and other network settings. Note: Even if router is up and it's configured properly, you need to check the computer is connected to correct and working router port too, sometimes it might be connected to faulty port or incorrect port (such as uplink port). Note: If you have enabled firewall on router, make sure firewall is configured correctly without dropping legitimate network packets. 7) If you can ping the router IP, then you should be able to ping the other computers or notebook in your network. If you still fail to ping the router IP or other computers, then you can take a look on the wireless network setup or wired home network setup tutorial in order to get more helps. 8) If you have successfully done above steps and all are working properly, but you still fail to connect to internet, then check your DSL, cable or wireless modem to make sure all cables are connected correctly. Reset your DSL, cable or wireless modem and try internet access after that. If your network is still down after that, contact your ISP for getting further helps to troubleshoot this network problem. This might due to some problems at your ISP side sometimes or the modem is broken. Note: Sometimes you might find out your computer is connected to network, but just cannot browse Internet websites. So what to do next? Just use nslookup to try resolving the domain name, if there is problem then you can try to use the free DNS servers (208.67.222.222, 208.67.220.220) provided by OpenDNS. Note: The other possibility, if suddenly you fail to access any webpage, maybe your computer is infected with adware, malware, worm or virus, so you should scan your computer by using antivirus or antispyware with latest signature. WinSockFix is also known as WinSock XP Fix! This is a popular program that usually used to fix Windows XP networking problem that caused by faulty WinSock or registry. If you encounter the following networking problems, and you have tried all other methods to resolve the problem but failed, then you can give this simple program a try. When you run the program, it will make changes on your registry in order to fix the winsock and network errors. 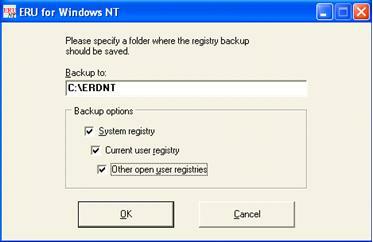 The program can create a registry backup of your current registry settings, so it is quite safe to use. 1) Click here to download this WinSockFix if you want to try! 2) After downloading the program, you can just double click the program to run it. Advise you to click on ReG-Backup to backup the current registry first, after that click Fix to try solving your networking problem. Note: When you backup the registry files, you can select the directory to save the registry backup. 3) Finally, you need to restart the computer, then test your network or Internet connection. Good luck! 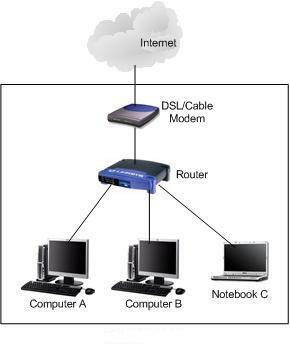 This article will explain how to configure client computer to use ICS (Internet Connection Sharing) to access Internet. There are 3 methods available to configure ICS client computer, which are DHCP setup, manual setup and network setup wizard. This is the easiest way to set up client computer. It works on all versions of Windows OS. What you need to do is to configure TCP/IP on local area connection to obtain an IP address automatically on client computer. The computer will be assigned IP 192.168.0.x and other network information from ICS host computer automatically. How to monitor and manage your shared Internet connection from a client computer? You won’t be able to control shared Internet connection if you use DHCP or manual setup method. Answer is you need to use Network Setup Wizard to install the Internet Connection Sharing Discovery and Control on client computer. Not too sure how to install? Check out here to learn how to configure client computer by using Network Setup Wizard. There is new Internet Connection icon created in Network Connections window after installing the control on client computer. 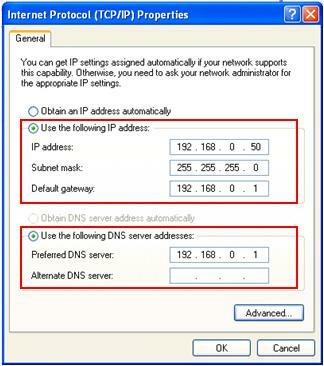 Same as DHCP setup, the client computer will be assigned IP 192.168.0.x and other network information automatically. Right click Internet Connection and click Status, you would then be able to monitor the connection status and enable/disable shared Internet connection. If you use Microsoft Internet Connection Sharing to access the Internet, then you can run Network Setup Wizard to install ICS Discovery and Control to access Internet, monitor and manage your shared Internet connection from a client computer. Here is how it works: The ICS host computer will advertise its shared connection to client computers with a broadcast if ICS is enabled. The ICS control on client computer then detects the broadcast, and an Internet Connection icon for the ICS host computer automatically appears in the network connections folder. This icon will allow ICS clients to remotely monitor and control the shared Internet connection. 1) Run from Windows XP CD: This is easy. Simply insert XP CD, then Welcome to Microsoft Windows XP screen will appear. 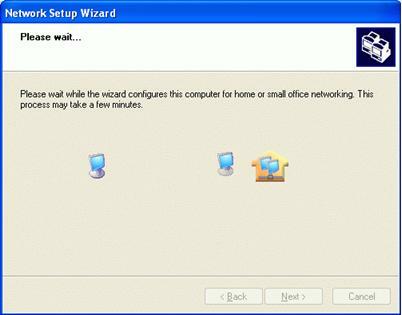 Click Perform Additional Tasks, and then click the option to Set up a home or small office network. The wizard window will appear. Note: If the Welcome to Microsoft Windows XP screen doesn’t appear automatically, click Start and Run. Run window will appear, type in D:setup in the box and click OK. If your CD-ROM drive letter is not D, type your correct CD-ROM drive letter. The XP Welcome screen will appear later. 2) Run from floppy disk: You need to create floppy disk at the end of running Network Setup Wizard on ICS host computer, then insert the floppy disk on client computer. Go to Start and click Run. Run window will appear, type A:etsetup and click OK. The wizard window will appear. Kindly follow step-by-step instructions to configure client computer after launching the wizard. 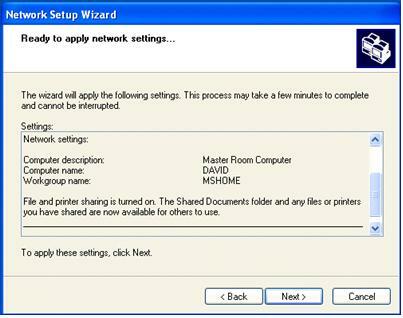 1) Welcome to the Network Setup Wizard window will appear, click Next. 2) A simple checklist window appears. Before you continue, make sure ICS host computer is on and connecting to Internet. Click Next. 3) Here you need to select a connection method. Select This computer connects to the Internet through a residential gateway or through another computer on my network option. Click Next. Note: You only select This computer connects directly to the Internet. The other computers on my network connect to the Internet through this computer option for configuring ICS host computer. 4) Give this computer a description and name window appears. The computer name must be unique in your network. Do as what mentioned and click Next. 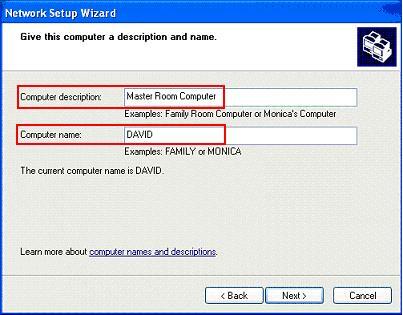 Note: You can always click Back to modify previous setting or click Cancel to quit the wizard without any installation. 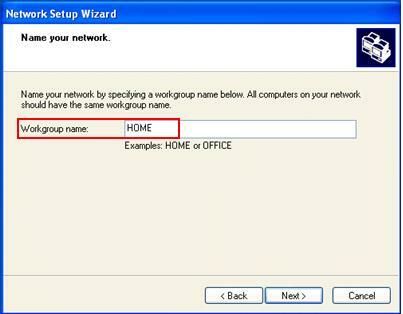 5) Key in Workgroup name in Name your network window. Click Next. 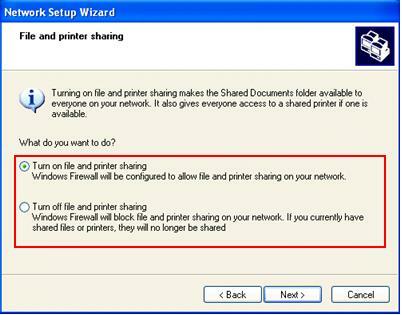 6) When File and printer sharing window appear, click turn on/turn off file and printer sharing as according to your needs. Click Next. 7) All the selected settings would be displayed in this window, check all settings and feel free to click Back to modify the settings again. 8) If found no problem, click Next to apply the settings. It will take some time to finish installation. 9) Click finish to quit the wizard at last. You have finished setting up the client computer. 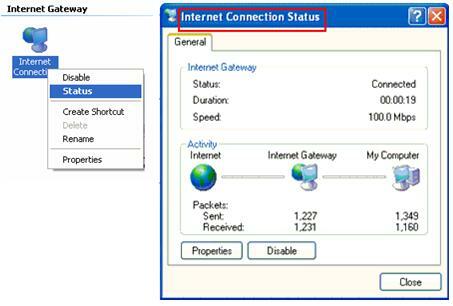 Now, open your network connection window, right click Internet Connection new icon and click Status, you would be able to monitor the connection status and enable/disable shared Internet connection. ICS Host Computer Setup in Windows XP! You need to enable Internet Connection Sharing feature on ICS host, so that it can share Internet connection with other computers. 1) Go to Start, click Control Panel. 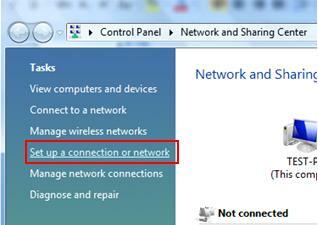 3) Network Connections window will appear. Right click the Local Area Connection that connects to Internet, then click Properties. 4) Local Area Connection Properties will appear. Click Advanced tab, tick the Allow other network users to connect through this computer's Internet connection check box. Note: Only System Administrator can access Advanced tab. Note: Please make sure you enable ICS on the connection that connects to Internet. 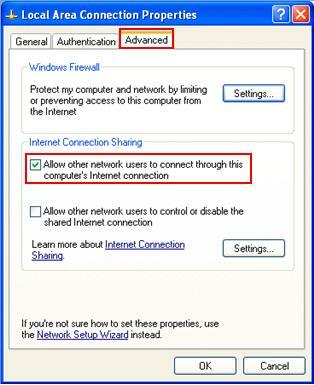 Note: If you want other network users to enable or disable the shared Internet connection, tick the Allow other network users to control or disable the shared Internet connection check box. 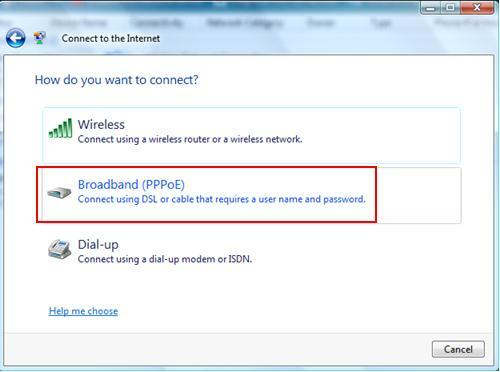 This option is useful if you use modem dial up method to access Internet. For cable/DSL connection user, this option is better disabled and centrally managed by system administrator. Note: Tick Establish a dial-up whenever a computer on my network attempts to access the Internet if you use modem dial up method to access Internet. This check box is only available on the dial-up connection’s properties. Note: You should not use this ICS feature in a network with other domain controllers, DNS servers and DHCP servers. Those servers would affect the Internet Connection Sharing from working properly. Note: If you have 2 or more home network connected by ICS host computer, you need to bridge those network for accessing shared Internet connection. For more information, read this network bridging in Windows XP. 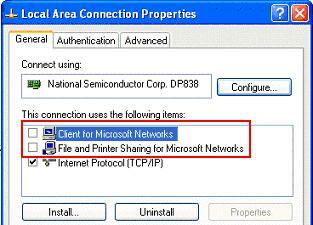 5) You should untick Client for Microsoft Networks and File and Printer Sharing for Microsoft Networks check boxes on shared connection properties. This approach would better secure the network and won’t accidentally expose your home network resources to Internet. 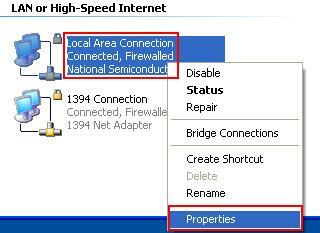 Firewall is also highly encouraged to be enabled on ICS host computer. Click OK at last. 6) You will see there is a hand supporting shared network connection. 7) After enabling ICS feature, the network card connected to the home network would be assigned a static IP address 192.168.0.1 with netmask 255.255.255.0. The ICS host will act as a DHCP server assigning other IP addresses in the 192.168.0.x/24 range to other client computers. 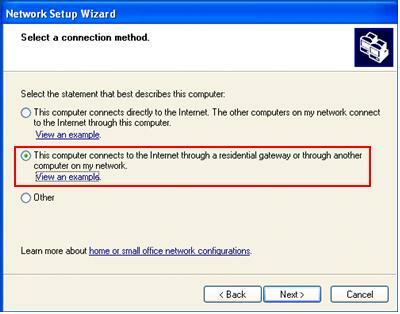 8) In order to access Internet, client computers (Windows XP, 2000) should configure TCP/IP on their local area connection to obtain an IP address automatically. Then those computers will be assigned IP address in the 192.168.0.x range and able to access Internet through this ICS host computer.